In the next five years, there will be a 3-D printer in every home in America. The majority of household items and others — from cups to kitchenware to watches to clothing — will be printable from home. That’s what Bre Pettis, CEO of MakerBot, predicts. It’s a timeline that many think is impossible. In an interview with Mic, he outlined his bold vision for the next big tech revolution, which may very well transform how we live sooner than we think. And the wildest part? He already has an incredible community of early adopters who could help make it a reality. For those who can’t wrap their heads around the concept of 3-D printing, it’s a way to render virtual 3-D designs as physical objects. A “normal” printer works with ink. A 3-D printer uses materials like plastic. It carefully puts down one layer upon another, according to a design, and in hours the printer has created a 3-D object, whether it’s a toy, cell phone case or a prosthetic hand. There are a range of challenges Pettis and MakerBot face in bringing 3-D printing to the masses. One big obstacle is consumer education and adoption, another is improving the technical capacity of desktop 3-D printers and a third is bringing down their cost (currently upwards of $2,500). “The trick is a lot of people need to see it to believe it,” Pettis says. Accordingly, MakerBot’s next milestone is for everyone in America to know someone who has a 3-D printer. To facilitate that, MakerBot launched MakerBot Academy in November 2013. 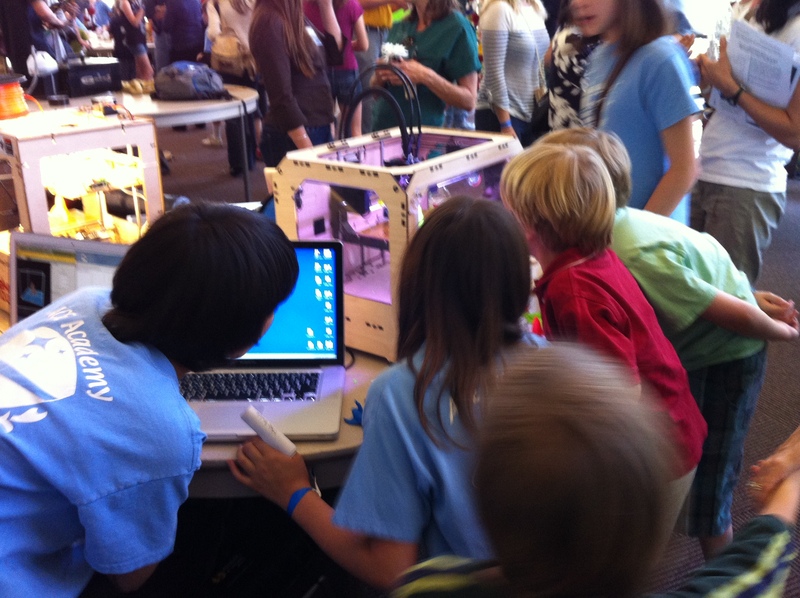 The goal is to put a 3-D printer in 100,000 schools in America. So far, there are MakerBots in 2,000. The opportunities 3-D printers offer teachers and students are myriad: students can create replicas of the Pyramid of Giza in a unit on ancient Egypt or print frogs for a unit on amphibian anatomy. 3-D printers unlock students’ ability to create things. Other big challenges MakerBot will face include improving the range of products available and ensuring they’re available at an affordable cost. In July, Home Depot started selling MakerBots in select locations. While the MakerBot Replicator costs $2,899, analysts predict the price tag for 3-D printers will continue to decline. Pettis also has a team working on material sciences to broaden the range of materials you can use in a MakerBot, and what you can make. Image credit: MakerBot / Thingiverse. All items were made using a MakerBot 3-D printer. As endless as the possibilities of consumer 3-D printing are, the potential of industrial 3-D printing is even greater: living in 3-D-printed homes, eating 3-D-printed food and functioning with 3-D-printed organs like kidneys and livers. Yet today, the dream is still far off. The 3-D printer market is relatively small. Most desktop 3-D printers are used by professional designers, architects or engineers for prototyping. (Indeed, 60% of MakerBot’s sales are to this group, according to the company.) Overall, the desktop 3-D printer industry only sold 72,503 units in 2013, according to Wholers, an industry research company. “The dreamland scenario of being able to print anything you want at home is unrealistic,” according to a Jefferies analyst. And yet the development and adoption of tech has a way of taking us by surprise, and innovators like Pettis continue to pull “dreamland scenarios” closer.